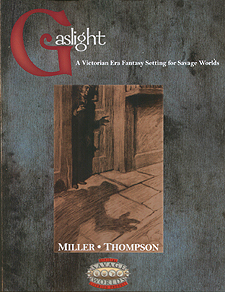 Battlefield Press, Inc Presents Gaslight. A Victorian fantasy where technology meets sorcery, where fantasy meets history. Welcome to a Victorian world of magic, non-humans and technology all trying to take their rightful place in society. Meet Vampire detectives, Beast men sheriffs and Wildling rogues. Non-humans in society exist from their counterparts in Victorian literature. An interesting and unique complete setting for Savage Worlds. A history of Gaslight earth. An overview of the secret societies and organizations that operate on the earth. Five races that play a part on Gaslight earth. Weapons and equipment from the Victorian era. A detailed gazetteer and timeline. A detailed reliquary of the relics found on the earth of Gaslight.